The unit testing and system testing are the interdependent activities of the software testing. Unit testing is the method of testing various isolated software components separately. But when it comes to system testing, it is the technique in which the entire system is exercised with a series of the different tests. 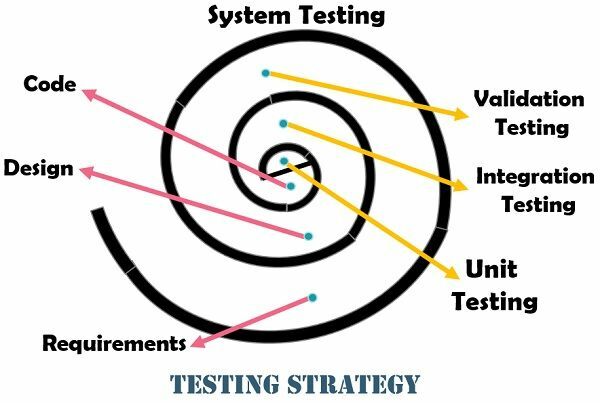 In the software testing process, the unit testing is situated in the innermost part of the spiral, on the other hand, system testing is shown in the outermost part of the spiral. Basic Focuses on the functional verification of the components. Validates the system after it is integrated in the larger system. Emphasis On the behaviour of the single module. System functionalities. Unit testing is the technique of substantiating the smallest units in the software. These smallest components of the software are tested in isolation. A driver component is responsible for generating method calls for the components being tested. The component which utilises a method is imitated as the stub. These stubs are the initial replacement for the misplaced methods. The unit test is directed by white-box testing, and the steps in the unit testing are carried out for multiple components simultaneous. It emphasises on, testing the proper flow of data along the module interfaces because if it is ignored the other tests would become uncertain. The stub can execute a plainly written imitation of the task of the component. It can display the message after the execution of the component. Either one of the operations given above could be performed at a time. The Unit testing is a vital part of the software testing which ensures the faster development, debugging, sound design, documentation and feedback mechanism, and further reduces overall cost. The System Testing verifies the behaviour of the system entirely. It performs various tests in progression. However, these tests have the distinct intent and check whether all the system components are working correctly in an integrated way or not. In this testing, the test cases are designed according to the requirement specification, and its code is said to be similar to the black box. The developers having the broad knowledge and visibility about the structure of the system usually performs the system testing. There are several forms of system testing among which few of them are describes below. Recovery Testing: This type of test make the software to decline in several ways for checking the proper recovery process. Security Testing: The security testing verifies the security mechanism and prevents the system from the penetration. Stress Testing: It is a testing technique in which the abnormal conditions of resources like quantity, frequency and volume are required. Performance Testing: Performance testing focuses on the software’s runtime performance in relevance to the whole system. The unit testing works on module specification. As against, the system testing obeys the integrated requirement specification for the software as well as hardware. In the unit testing, the code details are visible to the tester while this is not the case in the system testing. The reason behind this is that unit tests can be carried out by the developer of the module, but the system testing is a bigger task in which the tester and the developer are two different individuals to perform the different operations. The unit testing uses the technique of scaffolding where the generated code is not a part of the software and whose sole purpose is to bring off testing. On the contrary, the system testing does not use the scaffolding technique. In the unit testing, the emphasis is on the single module while in system testing the entire system functionalities are taken into considerations. According to the diagram shown below, the unit testing starts from the centre and focuses on each of the software unit (component) as per the implementation. Then comes integration testing where the design and construction of the software architecture are examined. When we go outward, the validation testing encounters where the requirements against the requirement specification are validated. System testing present in the outermost part which tests the software and its other system portions as an integrated component. The Unit testing is the testing technique in which the smallest unit of the program is tested. On the other hand, the System testing relies on the high-level design specification and checks whether the system implementation satisfies the system requirement specification or not.